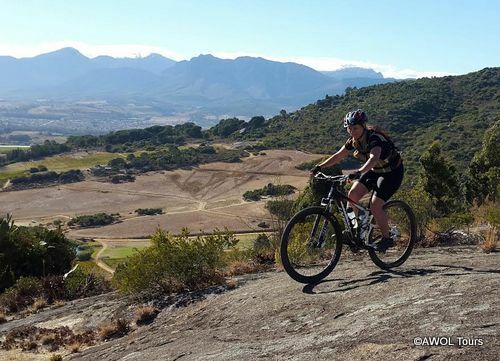 After the devastating fires on the Cape Peninsula destroyed the Tokai Mountain biking single trails, AWOL Tours mountain bikers are looking for alternative routes for adventurous clients in the winelands. Our latest quest for single tracks took us to Rhebokskloof Wine Estate in Paarl. 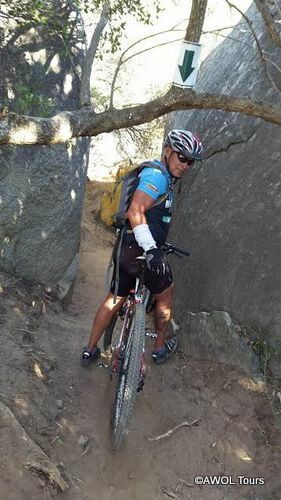 The trails at Rhebokskloof Wine Estate were opened in February 2014 and soon earned a reputation for the best single-trail experience in the Western Cape. The trails lead along the northern slopes of the Paarl Mountains and offer stunning views of the valley and wine farm. There are two route options available, the 20km Shiraz route and the 14km Chardonnay route. We tackled the 20km Shiraz route which appears to involve only a little bit more climbing than the shorter route. The single trails lead up to some amazing view points. 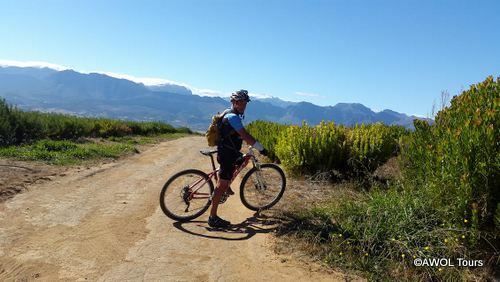 The Shiraz route offers easy access to the Paarl Nature Reserve for those who want to do a little bit of extra riding. The natural terrain of this area typically consists of indigenous Fynbos and granite formations. The incorporation of granite boulders and tricky drops into the single trails tests a mountain biker’s technical skills. 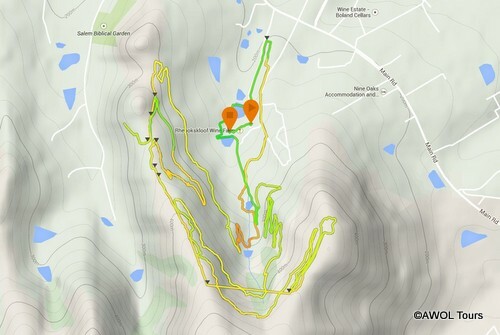 Rhebokskloof also makes for some nice switchback training. The total climbing of the Rhebokskloof trail is not that challenging but the single trails give every avid mountain biker a good opportunity to exercise skills. After cycling, we can relax in the The Rhebok restaurant, which is popular with locals for its delicious seasonal food, paired with Rhebokskloof wines. Diners can enjoy the view from the terrace for lunch, or be served by the fireplace inside the restaurant during the colder winter months. Experience the fusion of South African recipes and French culinary traditions by our Executive chef Alicia Giliomee. That said, Rhebokskloof is definitely worth a ride and now one of the favourites on the AWOL Tours mountain biking tours agenda. And, of course, a wine tasting at Rhebokskloof Wine Estate is not to be missed after a thrilling ride.